[無料] Cosmo Desktop | Mac App Storeのアプリ検索・ランキング BuzzMac! 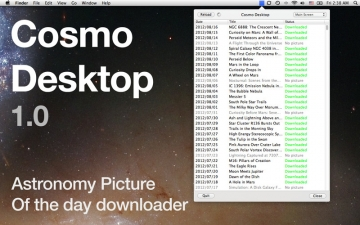 Cosmo Desktop is a beautiful Mac application that serves the latest NASA astronomy pictures http://apod.nasa.gov/ to your desktop. You can set your Mac desktop to the beautiful Astronomy picture right to your Mac in a few clicks. All astronomy pictures are courtesy of the NASA Astronomy Pictures of the Day, and their respective owners.